Samanya gyan is a hindi general knowledge app. In this Samanya gyan apps will you found most important gk in hindi offline. In this GK Hindi ( General Knowledge in hindi app ) application we will cover all the topics like General Science, Geography, Indian Constitution, Indian History, Computer, Abbreviation, International Days, Election Commission, Games and Sports, Gandhi Era, etc. Main purpose of this GK In Hindi 2019 app is preparing yourself and as we all know, there is a lot of scope for Indian youth in competitive exams like SSC, IAS, PCS, SSC CHSL, RRB, Other Competitive exams and Govt job exams , GPSC(Gujarat Public Service Commission), UPSC(Union Public Service Commission). SSC, Bank Exams or Clerk PO exams. This GK Hindi (Hindi General Knowledge) application will be updated with latest questions and Current Affairs related materials in every 2/ 3 months. 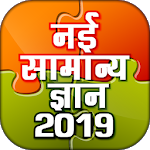 samanya gyan 2019 / gk in hindi app is useful for IAS, UPSC, SSC, IPS, BANK PO, BANK CLERK, BANK EXAMS, IFS, PCS, CIVIL SERVICES, BANK SPECIALIST OFFICER, RRB or REGIONAL RURAL BANKS, STATE CIVIL SERVICES, POLICE EXAMS, SSC CGL, CISF, CAPF, NDA EXAMS, CDS EXAM, RAILWAY EXAMS, GOVERNMENT JOB EXAMS, IBPS BANK EXAMS, IBPS CWE EXAMS, INSURANCE EXAMS, POST OFFICE EXAMS, NICL– Assistants, AICL – AO, UICL – AO, APPSC, BPSC, Chhattisgarh PSC, GPSC, HPSC, HPSSSB, HPPSC, JKPSC, Jharkhand PSC, Kerala PSC, MPPSC, MPSC, Delhi Subordinate Services Selection Board, OPSC, RPSC, PPSC, TNPSC, UPPSC, WBSETCL. If you like ours apps then rate us with 5 star and share it with your friends . And the most important thing is don’t forget to give 5 star . Similar to "Samanya Gyan - Hindi GK 2019 Offline"